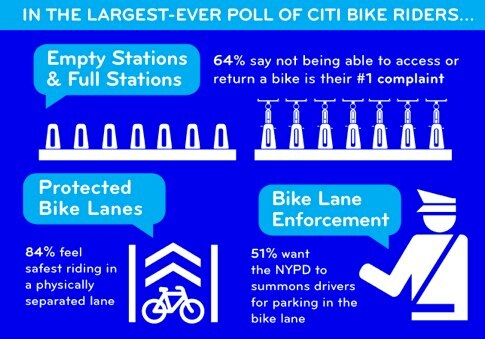 In the latest issue of “StreetBeat,” Transportation Alternatives shares the results of the first in a series of online “flash polls” of Citi Bike riders. The polls are intended to gauge how members use the system, and how they’d like to see Citi Bike, and city streets, made better. Over 2,200 people responded to the first poll, TA reports. “The idea is to continue to dig into the issues that are coming up for folks,” says TA spokesperson Brian Zumhagen. Issues like keeping stations balanced and program expansion are indicators of bike-share’s popularity. Survey responses also point to the city’s obligation to create and maintain a safe environment for cycling, through engineering and traffic enforcement. As Citi Bike approaches 100,000 members after five months of operation, DOT is set to release its own survey of approximately 1,000 users, which will examine how bike-share has changed travel behaviors. The Department of Health is conducting a long-term study on effects of the program on members’ health. In the meantime, Citi Bike users can take TA’s Flash Poll #2, which “delves into solutions to the problems Citi Bike riders identified as most critical.” A third poll will be posted before year’s end, Zumhagen says, and will be followed by a summary report. I just took poll #2, but the last question, which asks whether you ride on the left- or the right-hand side of the street on one-way streets was such a definite “it depends” that I refused to pick an answer. One of every eleven Citi Bike riders doesn’t want the system to expand? Can Mr. Zumhagen elaborate? There should be an option to take the poll without signing up for the mailing list. I don’t want TA emailing me and having to keep unsubscribing. As an extensive Citibike user I would also like enforcement against bikers riding the wrong way down the street/lane please! NYC Has a Bike-Share System That Works. Why Aren’t We Expanding It? Instead of extending the usefulness of Citi Bike to more of the city, a two-tiered system could emerge in which neighborhoods outside the current Citi Bike service area get frozen out. Which candidate for City Council would be best for walking, biking, and transit in Bay Ridge?